The Turnbull Government will create up to 1450 jobs across Australia through the purchase of a fleet of new Combat Reconnaissance Vehicles for the Australian Defence Force. The world-class vehicles will be manufactured and delivered by Australian workers, using Australian steel, under a contract with German contractor Rheinmetall. The 211 vehicles will provide improved safety to Australian soldiers on deployment and on exercises around the world. They will boost mobility and firepower on the battlefield in the decades ahead. 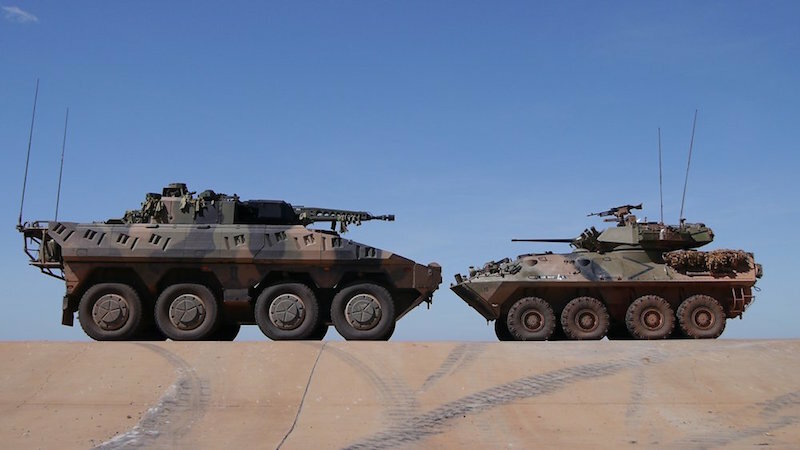 The decision to select Rheinmetall is the result of a comprehensive three-year tender and rigorous testing process, which assessed its Boxer CRV as the most capable vehicle for the Australian Defence Force. The CRVs will undertake a range of missions, from regional stability and peacekeeping through to high-threat operations. The Government will spend $5.2 billion to acquire the 211 vehicles, which will replace the Army’s current ageing Australian Light Armoured Vehicle fleet. Over the 30-year life of the vehicles, Australian industry will secure two thirds, or $10.2 billion, of the total investment in acquiring and maintaining the fleet, creating up to 1450 jobs right across Australia. Federal Cabinet also considered a bid from BAE Systems, which was set to build the light armoured vehicles in Victoria. Buying and maintaining the vehicles is expected to cost $15.7 billion. Rheinmetall is working with more than 40 companies across Australia, ensuring the delivery of these vehicles will be a national enterprise. This project will create jobs across Australia, including 330 in Queensland, 170 in Victoria and 140 in New South Wales during acquisition. It presents an exciting opportunity for Australian industry to play a vital role in delivering leading-edge capability and technology to Australia’s Army. The Turnbull Government is also spending about $235 million to upgrade facilities in Puckapunyal and Bandiana in Victoria, Adelaide, and Townsville and Enoggera in Queensland, where the vehicles will be used. The new CRVs are part of the Turnbull Government’s $200 billion investment in our defence capability over the next decade to ensure the Australian Defence Force is equipped to succeed in our challenging strategic environment. The Government is determined to leverage this investment to build a sovereign and sustainable defence industrial base as a national strategic asset. Our investment decisions in defence capability are complemented by a comprehensive defence industry policy agenda to support a robust, resilient and internationally competitive defence industry, which will support jobs and investment across the country. The Government would like to congratulate Rheinmetall and BAE Systems Australia for the quality of their tenders. They were great examples of international companies teaming with Australian industry. The multi-billion dollar project will see Rheinmetall deliver at least 211 of the latest generation Boxer 8x8 vehicles, with Rheinmetall's advanced Lance 30mm turret fitted to the reconnaissance variants. To deliver the project Rheinmetall will establish a state of the art Military Vehicle Centre of Excellence (MILVEHCOE) near Brisbane in partnership with the Queensland State Government. 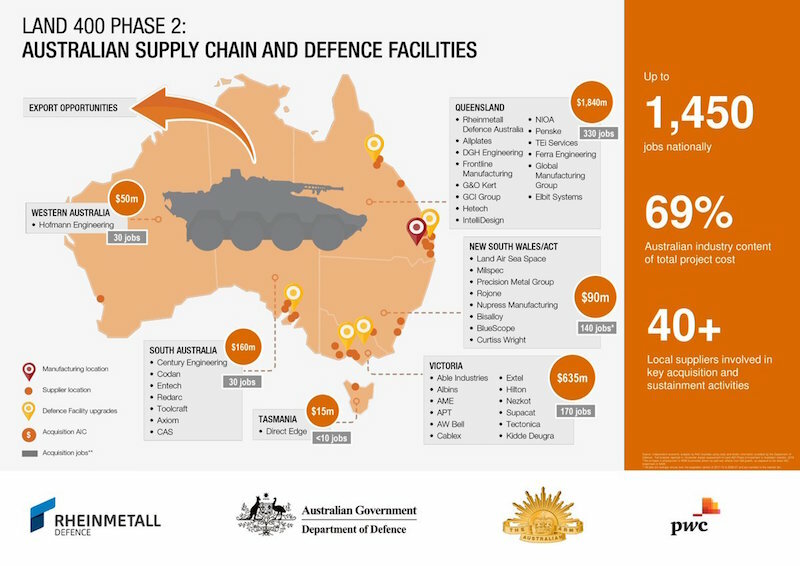 The MILVEHCOE will serve as the focal point for the execution of the program and a base for the establishment of an export orientated military vehicle industrial complex in Australia. The MILVEHCOE will support the Australian Governments Defence Export Strategy that was recently announced by the Australian Minister of Defence Industry, The Honourable Christopher Pyne MP. The Boxer 8x8 provides an unparalleled level of capability in a highly mobile, survivable, adaptable vehicle that will see Australia join leading nations already using the vehicle including Germany, The Netherlands and Lithuania. The Lance turret fitted to the vehicle utilises the latest technologies that allow the Boxer CRV to be uniquely aware of its environment, with advanced systems to automatically detect, characterise and track threats on the battlefield. The turret features a range of scalable effects, including non-lethal systems, the latest air-burst cannon technologies and a guided anti-tank missile system that allows the crew to engage the most aggressive threats on the battlefield. Ben Hudson, global head of Rheinmetall's Vehicle Systems Division, said, "We are honoured to have been chosen by the Australian Government at the conclusion of the rigorous Land 400 Phase 2 selection process. I must pay tribute to the Rheinmetall team and our Australian partners that have contributed to Land 400; their tireless dedication over the last three years will ensure that the Australian Army receives a vehicle that allows them to fight, survive and win on the battlefields of today and tomorrow." -- Hoffman Engineering from Western Australia. 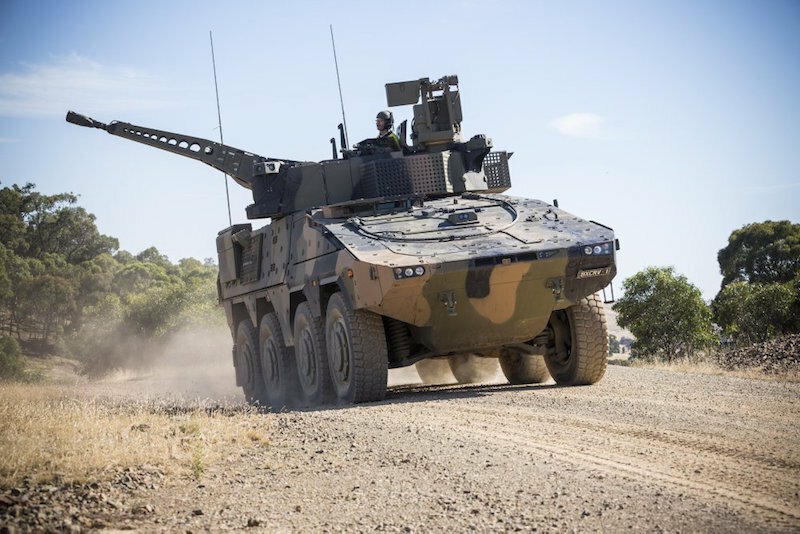 Gary Stewart, Managing Director of Rheinmetall Defence Australia, said "The Land 400 program will enable the Australian Army to receive the best CRV capability for their needs, and create a long term, economic benefit for Australia. Rheinmetall's investment in the MILVEHCOE will enrich the economy in the high technology advanced manufacturing sector and broaden employment in defence across the nation. In doing so, we will create a strong sovereign military vehicle industry that allows Australian companies to innovate, compete and win globally." Today the Government announced the purchase of a fleet of new Combat Reconnaissance Vehicles for the Australian Defence Force, as part of LAND 400 Phase two. Over the 30-year life of the vehicles, Australian industry will secure two thirds, or $10.2 billion, of the total investment in acquiring and maintaining the fleet. The Government is also spending about $235 million to upgrade facilities in Puckapunyal and Bandiana in Victoria, Adelaide, and Townsville and Enoggera in Queensland, where the vehicles will be used. The new CRVs are part of the Government’s $200 billion investment in our defence capability over the next decade to ensure the Australian Defence Force is equipped to succeed in our challenging strategic environment. These decisions in defence capability are complemented by a comprehensive defence industry policy agenda to support a robust, resilient and internationally competitive defence industry, which will support jobs and investment across the country.